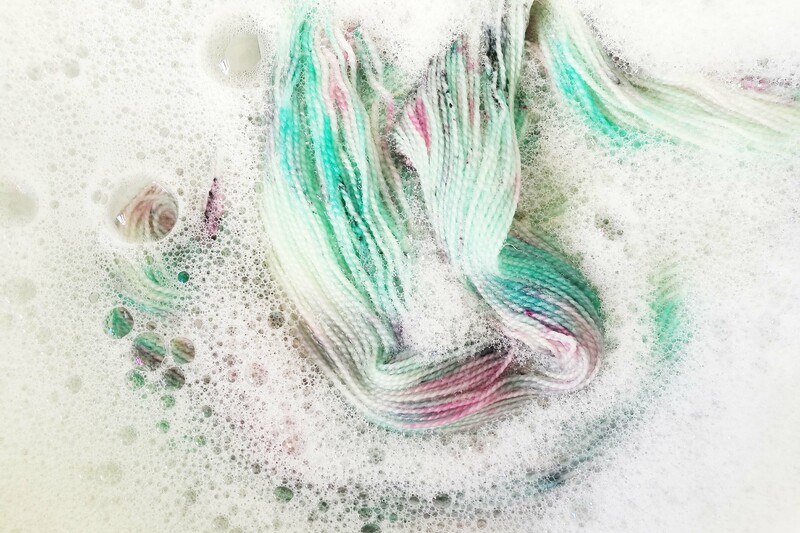 Miss la Motte yarns are rinsed post-dyeing in a natural, biodegradable and non-perfumed detergent and water. Some residual dye particles may remain, particularly where darker colours are concerned. Skeins are dried naturally, and stored in sealed containers until shipping occurs. Professional acid dyes are used in the dyeing process, together with citric acid as a dyeing aid. Miss La Motte's dyeing process takes cognisance of the current water situation in the Western Cape - where possible collected rain/spring water is used; rinse water is neutralised and re-purposed for household use. Dye lists are tiered in order to minimise water usage; and where possible, water is re-used. Yarns are dyed in small batches ensuring that each skein is carefully and attentively created. For long term care, a gentle detergent (preferably natural / organic) and cold water rinse is recommended. Refrain from excessive wringing. Dry flat, avoiding prolonged exposure to harsh sunlight.